These patterns are for personal or charity use only; to sell items made from this pattern, please contact me at breezybot@hotmail.com. Please do not reproduce or sell my patterns. I prefer back-and-forth joined rows with odd rows worked in the back loops and even rows worked in the front loops. This will give the gloves a little more stretch and make all odd the ridges on one side. I also like to use a slightly bigger hook to do the initial chain, then a smaller hook for the rest of the glove. This keeps the chain row from being too tight. For example, I'll use a 6.0 hook to chain and 5.0 hook to do the rest of the gloves. 1. With your larger hook, chain enough to fit loosely around your fingers where you want the end of the glove to reach. Slip stitch to join to make a circle. 2. 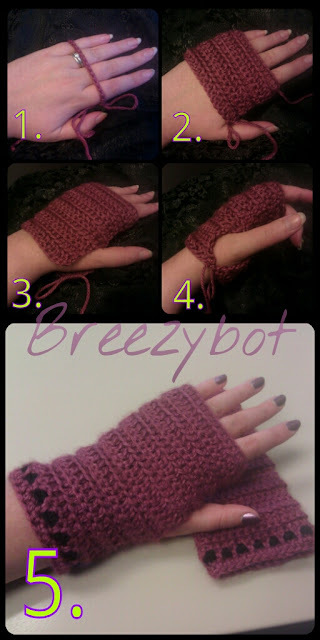 In back-and-forth joined rows, double crochet each row until it reaches the inside of your thumb. Work odd rows in back loops and even rows in front loops to give the gloves more stretch and ridges. 3. Continue back-and-forth rows as in #2, but do NOT join, until long enough to comfortably connect at the base of your thumb. 5. Continue back and forth joined rows until your glove is as long as desired. Repeat for glove #2.